Here lately I have been on a huge greek yogurt kick. There are so many uses for it, depending on the flavor you get. The plain greek yogurt can be used to replace butter and sour cream for a healthier alternative. Vanilla can be used for pretty much any and everything else. While I was browsing through the grocery store the other week, there was an awesome deal on greek yogurt so of course, I stocked up. Once I got home I had to figure out what to do with all of it. I decided to make my twist on a parfait and make a Strawberry Piña Colada Parfait Recipe. This recipe is great for breakfast, lunch, or even dessert. It is very easy to make and only takes seconds to assemble. Also, this recipe is very versatile and you can add in dried fruits,nuts, chia seeds, and so much more to create a unique parfait every time. 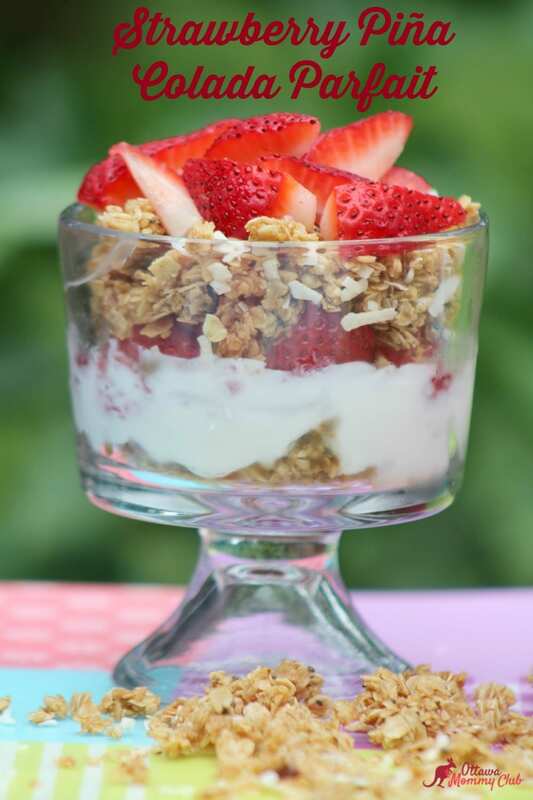 The secret to a great parfait is the yogurt, that is why I only use vanilla greek yogurt. It is creamy and filling and gives a parfait the right type of fluff. 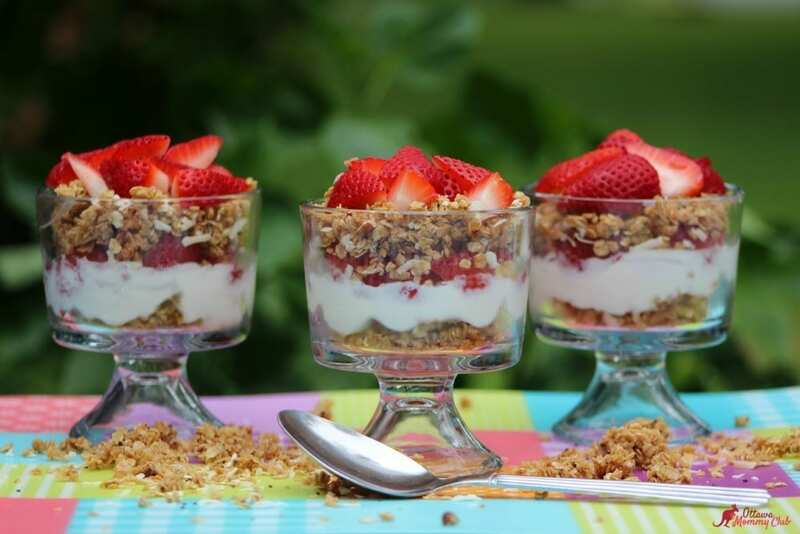 You will only need a few ingredients to make my Strawberry Piña Colada Parfait Recipe. -Pull out your parfait glass and begin to built your parfait. -Place 1/2 cup of the homemade tropical granola on the bottom of the glass. -Second layer will be 1/2 C of Greek Vanilla yogurt. -Top with half of the fresh Strawberries. -Repeat with a layer of the remaining granola. -Layer with the rest of the Greek Vanilla yogurt. -Top off the parfait with the remaining Strawberries. -Preheat cookie sheet to 250 degrees. -Treat cookie sheet with Pam spray. -Combine chia seeds, oats, salt and cinnamon in a bowl. -Mix the agave and oil. Stir them together. -Add to dry mixture and stir to mix all ingredients. -Dump out on prepared cookie sheet. -Spread the coconut and pecans on the top of the granola. -Bake at 250 degrees for 1 hour. -Allow to cool overnight for best flavor. -Store in a tightly lidded jar. -Will last for several weeks. I hope you enjoyed my Strawberry Piña Colada Parfait Recipe as much as my family and I did. If you make it, make sure to share with us on Facebook or Twitter! Also, check out all of our other Recipes. Pull out your parfait glass and begin to built your parfait. Place 1/2 C of granola on the bottom of the glass. Second layer will be 1/2 C of Greek Vanilla yogurt. Repeat with a layer of the remaining granola. Layer with the rest of the Greek Vanilla yogurt. Top off the parfait with the remaining Strawberries. Preheat cookie sheet to 250 degrees. Treat cookie sheet with Pam spray. Combine chia seeds, oats, salt and cinnamon in a bowl. Mix the agave and oil. Stir them together. Add to dry mixture and stir to mix all ingredients. Dump out on prepared cookie sheet. Spread the coconut and pecans on the top of the granola. Allow to cool overnight for best flavor. Store in a tightly lidded jar. Will last for several weeks. Yum Yum Yum Yum Yum! We were watching an Australian cooking show the other day and they were making a parfait and we were all amazed because its nothing like a parfait that we know! This looks so good! That is interesting! It certainly is good and so easy to prepare. Cereal would be a great substitutions to granola! 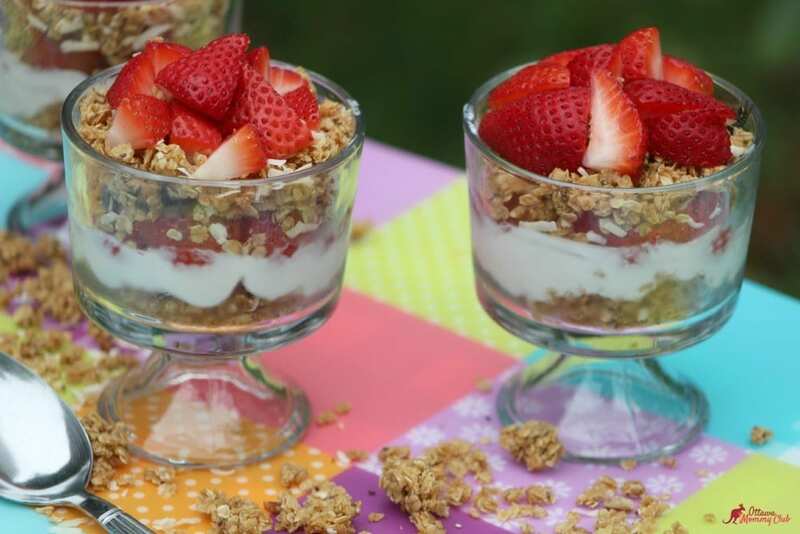 I absolutely love parfaits and these look delicious! Easy fun and delicious, thanks for sharing this recipe. This is really interesting and sounds so very tasty.. I enjoy Greek yogurt. Love strawberries so this is something I know I would very much like to try. Will be pinning this for later to make. Thanks! @ Sounds delicious! Cant wait to try! This looks so easy ,healthy and delicious tasting!Thanks for sharing with us.